Any system activity or job. Each time you boot a system, execute a command, or start an application, the system activates one or more processes. A virtual CPU or execution resource. LWPs are scheduled by the kernel to use available CPU resources based on their scheduling class and priority. 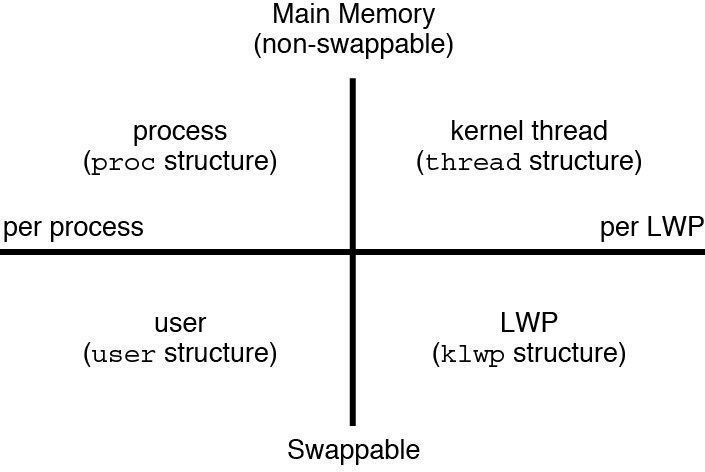 An LWP contains information that is swappable and a kernel thread that contains information that has to be in memory all the time. A series of instructions with a separate stack that can execute independently in the address space of a user. Application threads can be multiplexed on top of LWPs. The following figure illustrates the relationships among these process structures. Most process resources are accessible to all the threads in the process. Almost all process virtual memory is shared. A change in shared data by one thread is available to the other threads in the process.